BitCrypt9 is an amazing free file encryption software. This lightweight application is quite simple and intuitive, yet packs in quite a punch. BitCrypt9 can be used to quickly encrypt (and decrypt) any file, regardless of its size and type. It uses Triple Randomized Encryption technique to apply the DES encryption algorithm three times to the data blocks, thus greatly increasing the overall security of the encrypted file(s). Decryption is done only after the correct password (specified at the time of encryption) is provided. Even if two exactly same files are encrypted, the encryption is entirely different. 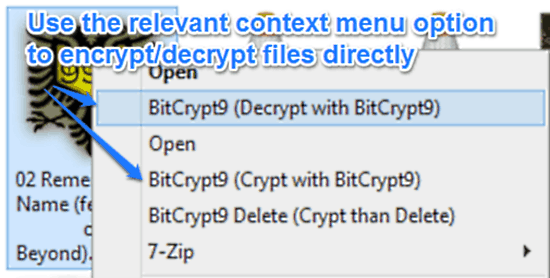 Although there are already a number of good file encryption software applications out there, what sets BitCrypt9 apart is the fact that it can detect changes in files that have been encrypted by BitCrypt9. Thus, if a BitCrypt9 encrypted file is modified even by a single bit, the application will refuse to decrypt it. As illustrated by the above screenshot, BitCrypt9 features an extremely simple and straightforward single window user interface. There are just two text fields that let you browse for and specify the file that you want to encrypt/decrypt, and enter the password for the same. Apart from that, there’s a virtual mini keyboard that can be used for entering the passwords safely so that they can’t be logged by key loggers (although for some reason, you can’t use lowercase alphabets in your passwords, not even using the physical keyboard. Apart from that, the special symbols allowed in the passwords are also a bit limited). A simple menu bar, and Crypt/Decrypt buttons complete the bare-bones user interface. 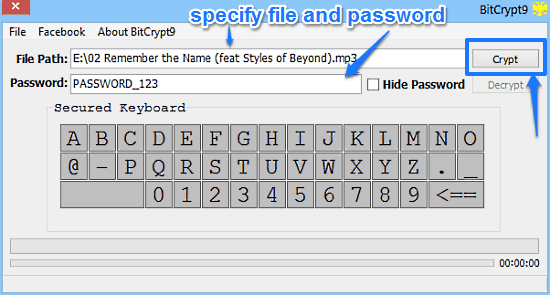 How To Use BitCrypt9 Free File Encryption Software? Step1 : Fire up BitCrypt9, and use the File > Open option to browse for, and specify the file that you want to encrypt. As mentioned before, you can encrypt any file regardless of its type and size. The selected file’s location will show up in the File Path text field. Step 2: Next up, enter the password. The password can be entered via the physical or on-screen virtual keyboard. However, the password can only use the characters displayed on the on-screen keyboard, and has to be at least six characters long. Once done, hit the Crypt button. 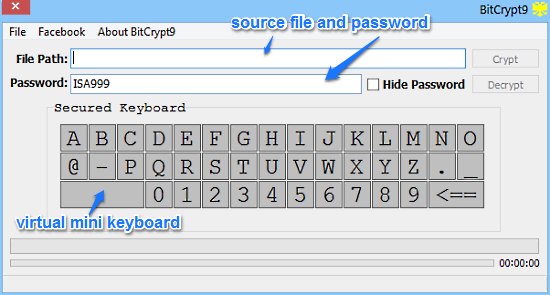 Once you hit the Crypt button, BitCrypt9 will use its triple randomized encryption to encrypt the specified file. Based on the size of the file, this process might take a while. You can easily check the time remaining via the status bar at the bottom. Once done, the application will automatically exit, and the encrypted file will be saved as a new copy in the same folder as the source file, but with a second extension ISA9. That’s all it takes! Ain’t that hard, right? Note: The procedure to decrypt an encrypted file is exactly the same as above. All you have to do is specify the encrypted file, enter the password, and hit the Decrypt button. BitCrypt9 is an incredibly useful free file encryption software. It’s lightweight and easy to use, yet powerful and feature loaded. The fact that you can easily encrypt/decrypt files regardless of type and size directly via right click is amazing. Add to it the fact that it even lets you delete files after encrypting them, and BitCrypt9 becomes even better. Do give it a try, you won’t be disappointed.